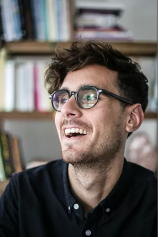 Twenty-six-year-old JP Pomare has been short- and long-listed for a number of writing prizes, including the KYD Unpublished Manuscript Prize, Ellen Kemp Memorial Prize, Sheila Malady Prize, and The Kingi Mckinnon Scholarship. He produces a literary podcast called "On Writing," for which he has interviewed bestselling authors including Joyce Carol Oates and E. Lockhart. CALL ME EVIE is his first novel. Pomare lives with his wife in Melbourne, Australia. For the past two weeks, 17-year-old Kate Bennet has lived against her will in an isolated cabin in a remote beach town --- brought there by a mysterious man named Bill. Part captor, part benefactor, Bill calls her Evie and tells her he's hiding her to protect her. That she did something terrible one night back home in Melbourne --- something so unspeakable that he had no choice but to take her away. The trouble is, Kate can't remember the night in question. As she tries to reconcile the girl she thought she'd been with the devastating consequences Bill claims she's responsible for, Kate will unearth secrets about herself and those closest to her that could change everything.